If desired, quickly tenderize chicken, making sure to not pound it too thin. Using a sharp knife, make a deep cut in the center of one side of each chicken breast, being very careful not to cut through to the top or the bottom – this will cause the cheese to go everywhere, and if it happens, you may want to consider not stuffing it with cheese (you can always add some on top). Season the chicken on both sides with the salt and pepper, and rub with olive oil. Heat a large skillet over medium heat and add 1/2 tablespoon olive oil. Add spinach and garlic, cooking until spinach is wilted, about 5 minutes. Add 1/2 ounce of parmesan and goat cheese inside each piece of chicken, pressing it as far back as it will go (you can do this while spinach is cooking). 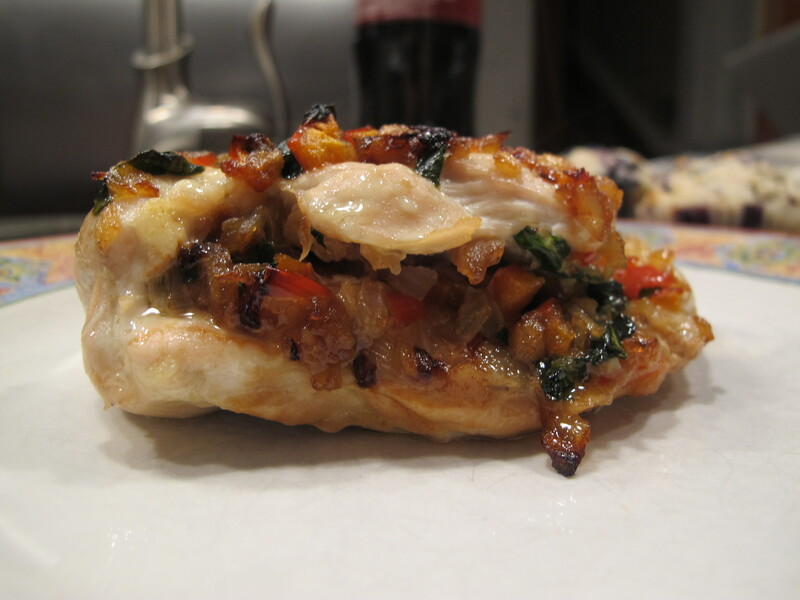 Add equal amounts of spinach into each piece of chicken. Line a baking dish with foil and spray with cooking spray. Place chicken in dish and bake for 30 minutes. This entry was posted in Chicken, Entrée, Italian on January 3, 2014 by Miranda @ Tempest Books.